Axis Of Oversteer: Congratulations to the Winners of the 80th Le Mans 24 Hour! Congratulations to the Winners of the 80th Le Mans 24 Hour! As the No.1 Audi R18 e-tron quattro of Andre Lotterer-Marcel Fassler-Benoit Treluyer took the chequered flag at exactly 1500 hours, Audi Sport today secured their 11th victory at the 24 Hours of Le Mans. But this was historic for a number of reasons as it was the first win at the world’s most famous endurance race by a hybrid-powered car, it was on the occasion of the 80th anniversary of the 24 Hours, and it was the first year that the famous endurance race featured as a round of the new FIA World Endurance Championship. 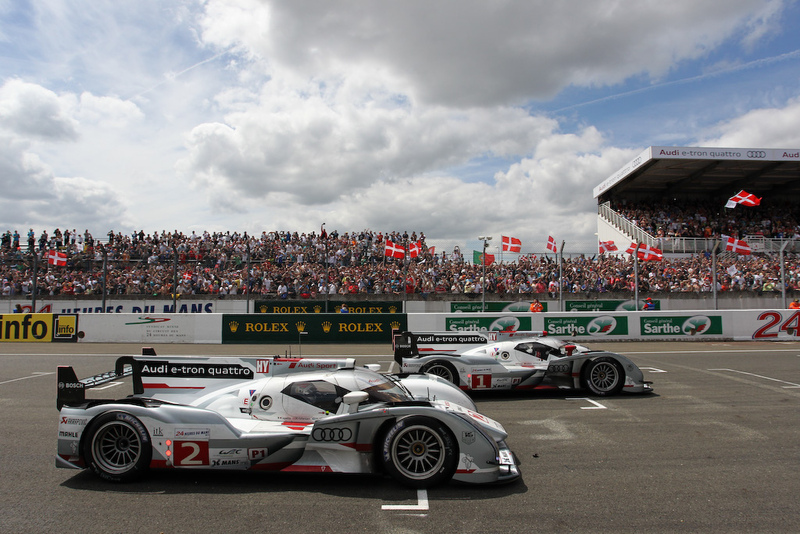 Audi filled all three places on the winner’s podium, with the No.2 Audi’s Tom Kristensen-Allan McNish-Dindo Capello in second and the conventionally diesel-powered No.4 Audi R18 ultra in third place. Mike Rockenfeller-Oliver Jarvis-Marco Bonanomi were the drivers. Breaking up the Audis, and finishing in fourth place after a display of amazing consistency and reliability, was the No.12 Rebellion Racing Lola Toyota of Neel Jani-Nicolas Prost-Nick Heidfeld. Rounding out the top six was Le Mans newcomer JRM Motorsport whose No.22 HPD ARX-03a was in the reliable hands of former winner David Brabham, Peter Dumbreck and Karun Chandhok, the first Indian to compete in the Sarthe classic. In LMP2, 12 of the 20 cars entered were still circulating after 24 hours which is a terrific achievement for all the teams involved in this privateer class. The best placed was the American No.44 Starworks Motorsport HPD ARX 03b entry, driven by 2011 class winner Tom Kimber-Smith with Ryan Dalziel and Enzo Potolicchio followed by three Oreca Nissans operated by Thiriet by TDS Racing, Pecom Racing and Signatech Nissan. The GTE production-led class allowed the world’s leading luxury car manufacturers to display a great display of racing in the early stages of the race, with battles between Aston Martin, Corvette, Ferrari and Porsche. However, in the end it was a dominant victory for Ferrari who took 1st, 2nd and 4th in class. 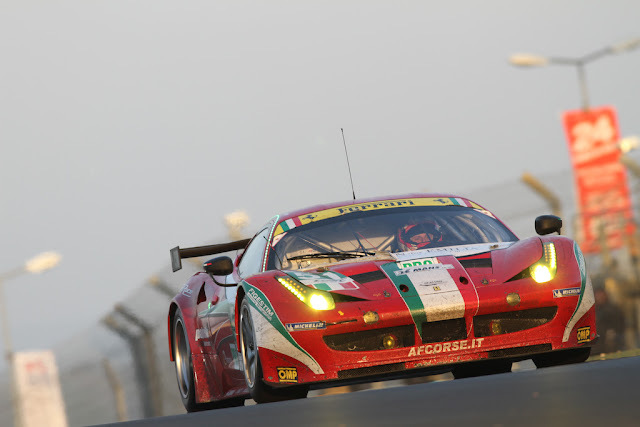 Having been completely re-built by the team in just one day following a testing accident, the No.51 AF Corse Ferrari 458 Italia, in the hands of Gianmaria Bruni-Giancarlo Fisichella-Toni Vilander, finished two laps ahead of the No.59 Luxury Racing Ferrari and the No.97 Aston Martin Vantage. It was a weekend to forget for the No.74 Corvette which had problem after problem following an impressive opening ten hours of racing, but the No.73 Chevrolet-powered car upheld some of the manufacturer’s honour on their 60th anniversary. After a neck-and-neck battle in the GTE Am race between the No.50 Larbre Competition Corvette of Julien Canal-Pedro Lamy-Patrick Bornhauser and the No.67 IMSA Performance Matmut Porsche of Anthony Pons-Raymond Narac -Nicolas Armindo, the former multiple-Le Mans-winning French team took the upper hand and recorded the victory. For Julien Canal it is his third consecutive GTE Am victory. 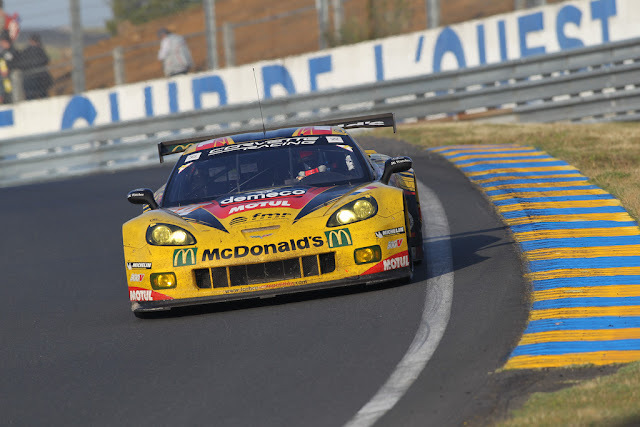 In third place was Krohn Racing’s Ferrari 458 Italia –Tracy Krohn and Nic Jonsson recording their third Le Mans podium finish and Michele Rugolo his first. There were 21 official retirements, the most notable of which involved the two new Toyota TS030 Hybrids. British driver Anthony Davidson in the No.8 Toyota was involved in a serious accident in the sixth hour which saw him taken to hospital with a back injury. Fortunately he will be well enough to leave in a few days. The other Toyota was also involved in the incident which ultimately saw the retirement from the race of the innovative Nissan DeltaWing. 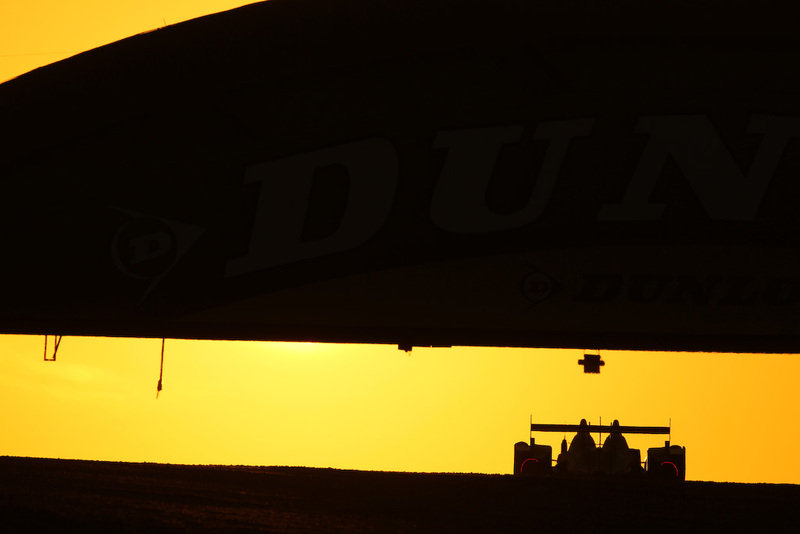 If you want to see a real race and relevant technology in action, it's Le Mans, MotoGp/SBK, or WRC. If you want to see a bunch of soccer players in slot cars, watch F1. M3's are in DTM instead.